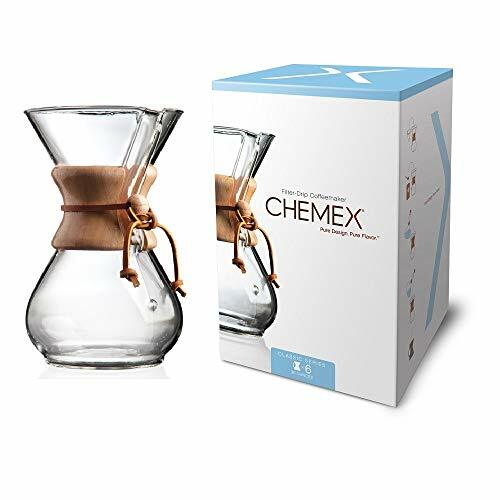 The Chemex line of coffee makers offers an elegant and simple answer to electric coffee brewers. You simply need the Chemex vessel, the heavy Chemex paper filters, coffee grounds of your choice, and hot water. The Chemex 6-Cup Classic Series Glass Coffee Maker is made of durable cast glass and may last for years if handled with care. As with all Chemex brewing tools, gravity is the engine of this simple and lovely coffee brewer. You will need a vessel in which to boil water. Once the water is heated to boiling, simply pour the water over the coffee and allow gravity and time to brew and drip you an excellent cup of coffee. Once brewed, you can transfer the coffee to a carafe to hold in the heat of your coffee. The Chemex Classic glass coffee maker is a bit thinner than the hand-blown version, but bother versions are made of unleaded glass. If you've ever wondered about the safety of hot water and plastics, a Chemex coffee carafe will banish those worries. The 6 cup Chemex features a fitted wooden collar that ties to the the pot with a leather thong. You don't need to remove this collar to wash out the pot, but you will want to avoid getting it wet. This collar will get warm against the glass, but it will protect your skin from the heat of the glass. Per the manufacturer, Chemex coffee must be brewed with Chemex filters. 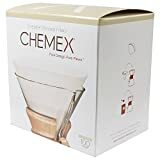 While fans of this brewing method swear by the flavor of coffee brewed through these filters, no Chemex coffee review would be complete without pointing out that if you run out of filters, you're in a pickle if this is your only coffee making tool. Manufacturers recommend transferring freshly brewed Chemex to a carafe to maintain heat. Simply discard the filter and used grounds, transfer or drink the remaining coffee, and rinse the carafe. You can allow it to air dry. Some users take a bottle brush to their Chemex on a weekly basis, but cleanup is easy. A fine cup of coffee is a grand start to the day, and fans of the Chemex tools and brewing method swear by the full-bodied and smooth flavor of coffee brewed through Chemex filters. If early morning is not a great time for you to focus, an electric kettle that only requires you to hit the power switch can save a lot of fumbling and fiddling with hot water and special filters. If you have any concerns about plastics exposure or would just enjoy the flexibility of a coffee pot that requires hot water but not electricity, a Chemex coffee brewer pots may be perfect for your kitchen.